Tonight we had a superb evening with John Beatty, speaking about his ‘Adventures in the Wild’. John has been a photographer for over 35 years and told of his aim to capture the ‘beauty and simplicity of the natural world’. John started by telling us of his links to Wilmslow, showing a photograph of himself as a young boy sailing his boat on Lindow Common and also explaining how he taught for 7 years at a local Secondary School – indeed he was the PE teacher of our very own Dave Swann and Ian Wilson. John’s expeditions and adventures have taken him all over the world. One of his first expeditions was to the Antarctic, to South Georgia, just before the Falklands War, and he was lucky enough to have the only photos of South Georgia, that graced the front pages of our newspapers, when the war broke out. He also visited the Arctic, skiing 400 miles across the Greenland Ice Cap, whilst hauling a leather sledge, and also spending time on the island of Spitsbergen, only 600 miles from the North Pole. Some of John’s other adventures included trips to: the Himalayas; the source of the Ganges; the deserts of Africa and Asia; spending time with an African tribe and witnessing a healing ceremony that lasted all night; living in a yurt with the nomadic Eagle Hunters of Kazakh Mongolia; trekking the tributaries of the Colorado River in the Grand Canyon with his family and also a visit to Alaska. His love of mountains and wild remote places was evident throughout his talk and it was all accompanied by stunning images and video clips, which emphasised the beauty of the natural world. He also told of his encounters with wild animals including grizzly bears, polar bears, lions, walruses, and meerkats and he spoke of ‘ that special moment when a wild animal looks you in the eye’. His talk contained many interesting anecdotes: the time he witnessed the ‘birth of a mountain’ when a volcano erupted in Iceland; the time he had high tea in a remote Buddhist Monastery in the Himalayas; the time his friend fell off an ice face and he managed to hold onto the rope for 18 hours until rescue arrived! John ended the evening telling us about his home and his love of the Peak District. He showed some incredible images that he had taken in that ‘five minutes of special light as dawn breaks’, thus showing that we don’t have to travel to the other side of the world to take a brilliant image, we just have to look around us – and be up early! Thanks to Dave and Ian for suggesting that John come to give us a talk and to Adrian for arranging it. We look forward to a return visit from John to hear more about his ‘Adventures in the Wild’ and to see more of his outstanding images. No pressure there then, plenty of time! As usual you can enter either or both sections showing your own interpretation of each. Aim for a presentation of around 5 minutes so that we get the chance to see everyone’s images with a little time for discussion in between. Does anyone have any thoughts /ideas for a practical evening early in the New Year? If so please let me know. 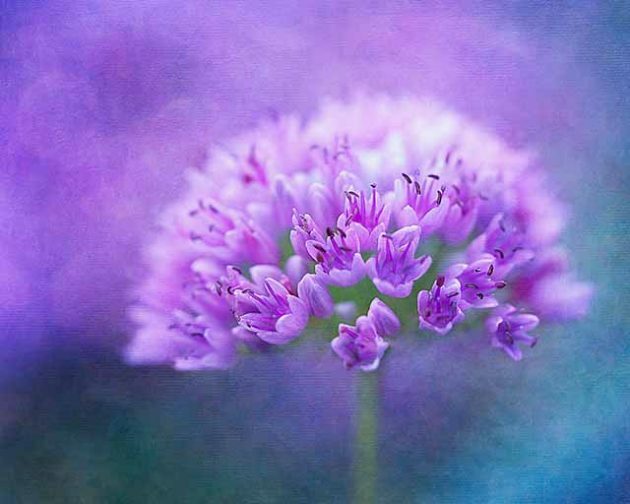 Wilmslow Guild Photographic Society will be exhibiting at the Wilmslow Guild at 1, Bourne Street on Friday 13 October (7:00 – 9:30), Saturday 14 October (10 – 4) and Sunday 15 October (11 – 3). Please join us as part of the Art Trail to view our Photographic Exhibition and find out more about the Society. At last Wednesday’s meeting I showed a meteor shower time lapse film I’d made on an iPhone. If you’re interested the app required to make similar videos, and for just about any astronomy-related iPhone purpose, is NightCap Camera. I was using version 9.0 which has the improved ‘meteor mode’. Note this app was previously called NightCap Pro and, for a very short time, Night Camera (I think). It’s currently £1.99 but there is no free ‘lite’ version any more. And remember there are more meteor showers coming up this year, almost all on nights when the moon won’t interfere too much! The Orionids, Leonids and Gemenids; in October, November and December respectively. 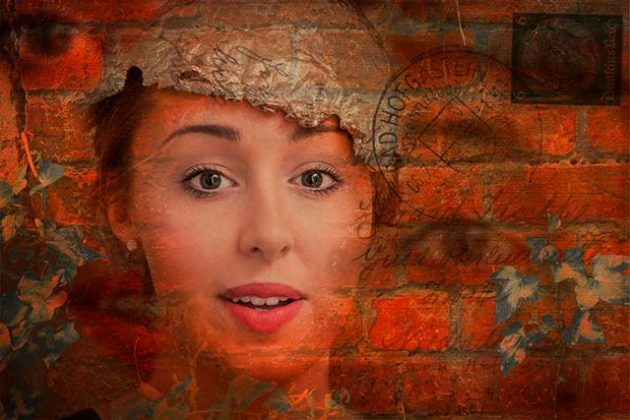 We have received information that the Wilmslow Guild AV Group are holding a Welcome Evening at 7.30 pm on Friday 15 September at the Guild where you can meet like-minded photographers and members of the AV group and find out more about AV. To find out more, please read the full invitation. 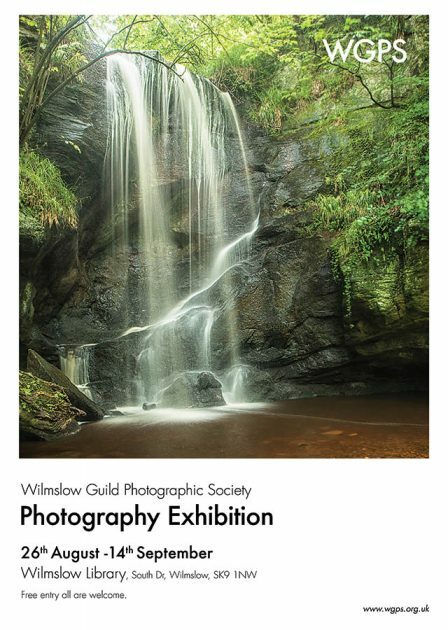 We will be holding a Photography Exhibition in Wilmslow Library Gallery from Saturday 26 August until Thursday 14 September. Do come along – entry is free and we will have a variety of exciting photographs on display with some of them for sale. For further information phone Mary Dolan on 07867428759. The Royal Photographic Society are holding a number of Events and Workshops which you may be interested in. There is a fee for each event but you don’t have to be an RPS member to attend. To be shown early next term (September) . You can contribute to either or both themes. A Story in Black and White. Any subject, any theme (e.g. people making something or even a holiday or day trip) Up to a maximum of 15 images, any method of presentation, even an AV if you wish. Same place, different times. Again it’s up to you, it could even be your garden or the local pub or church etc. Up to 15 images about the one subject taken at different times, you can use different viewpoints, different lenses, filters etc, whatever it takes to fulfil your interpretation of the theme. My thanks to those who have contributed in any way to the success of the Project Group this season. Despite a slightly disappointing quantity of entries our final monthly (print) competition continued the excellent quality we have seen throughout the season. Ably demonstrated by the winners who also head the final rankings in our Photographer of the Year competition. Congratulations to Michael Hilton (3rd) and Les Stringer (2nd) but especially to Barbara Cook who wins the coveted POTY trophy for the second year in succession. Another evening of great images in two competitions – General Mono & Weather Theme. Your chosen final selection of the long term themes of Ghost Signs and Street/Markets. An optional twist in this is for at least one of your ‘slides’ to include three images, comprised of an original image and two selected crops taken from that image. Each of the crops should ideally make an image that will stand up in its own right. This is basically an exercise in initial observation and post processing presentation skills. As ever, no judgements, no prizes. It’s all about trying to do something different to improve your photographic and computer skills. Our new format of having a Theme or Genre section every month alongside a standard ‘Open’ competition appears to be finding favour with members. 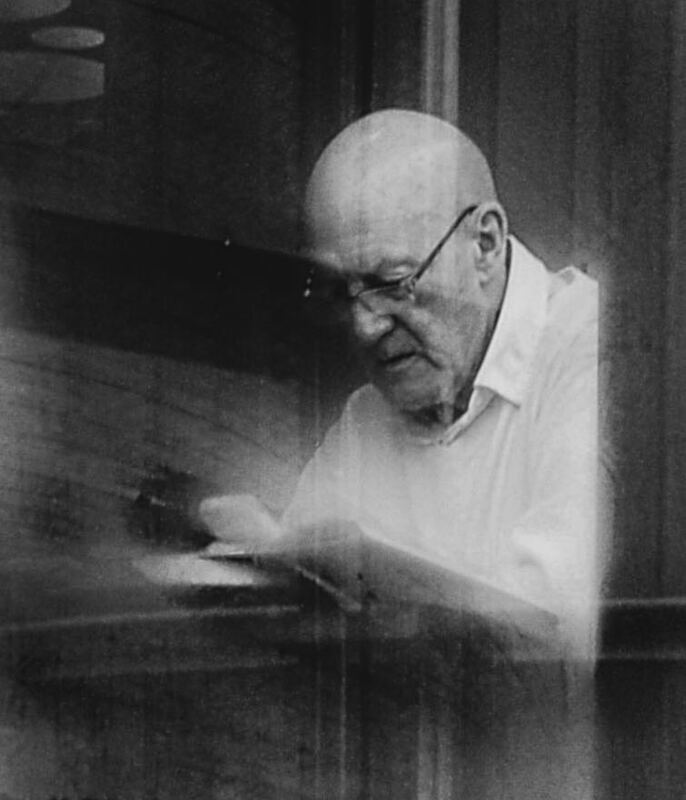 This month the Genre was ‘Digital Device’ – images taken on a phone or tablet. 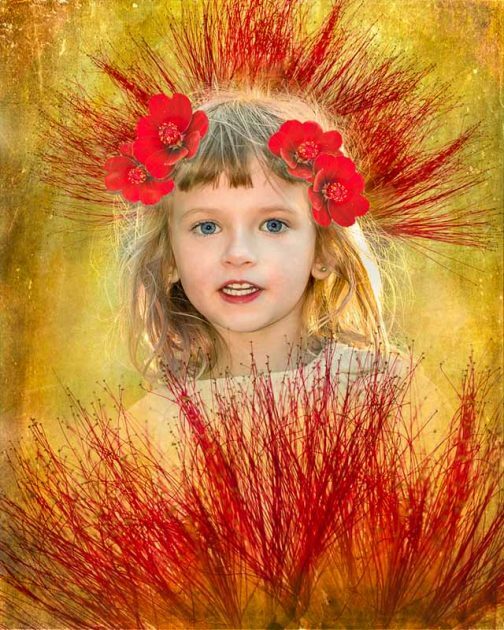 Congratulations to the winners – pleas upload DPIs of your winning images! The crowded room immediately fell silent as Stephen grabbed everyone’s attention with a taster of his quite spellbinding time lapse productions. His productions were not just brilliant photography but were enhanced by a great variety of complementary music! Having specialised in landscape photography for over 25 years Stephen explained how several years ago he was looking for something new, something different, to challenge him and he ‘found’ time lapse photography. After a brief history of time lapse photography he went on to explain the hardware and software needed for the job. To achieve his exceptional level of accomplishment some specialist kit and software is needed but he explained how basic time lapse photography was within the reach of most keen amateur photographers. The very professional and most enjoyable presentation was illustrated with several films that he had created. We saw sunrises and sunsets, the Northern Lights, the Milky Way, shooting stars, and clouds scuttering across the skies. We visited Scotland, the Lake District and Iceland, and as a finale, we flew around North Wales on Stephen’s TIME SHIFT magic carpet. WGPS Project Group – Next Meeting Friday 10th February 2017 at 7.30pm. Any glassware images from 27th Jan evening of any home produced work from those who couldn’t get there. Any entries for the next competition that you wish to show or discuss, the subjects having been taken on a digital device. It is a print competition but DPIs will be fine for this night. An open session, bring along any images that you care to show or discuss. In addition feel free to bring your camera along if there are settings on it that you do not understand or would like to know more about. We will also choose subjects for the next meeting which will be back to the normal format. 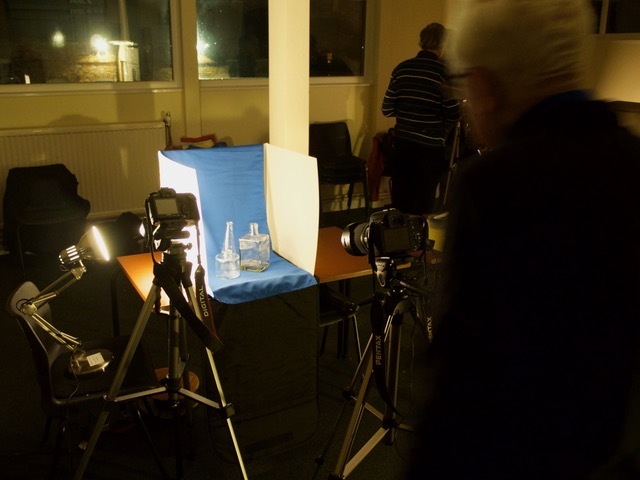 WGPS practical evening – photographing glass objects. 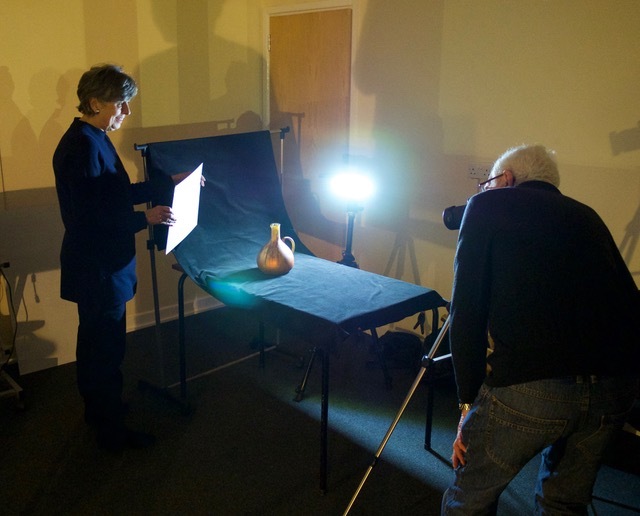 Glass objects are notoriously difficult to photograph because of the issues with reflections. This sets a challenge for the Project Group, so by way of a change we are going to have a practical evening at the Guild so that we can share and draw upon each others ideas and experience. A certain amount of equipment and setting up will be required, some of the items that could be used are listed below. Not everyone will have access to all items and indeed some may have different ideas altogether. Please bring along anything that you think may be useful. A glass subject to be photographed. Clear, simple (no designs), unmarked wine glasses , make a good start. More ornate items, such as jugs, vases or paperweights can be tried later in the evening. Black, white (for reflectors), red and green card (or other colours) for background (£1 shops)? A piece of black mount board with a hole in the centre which is just smaller than the wine glass. You will need some method of raising this up to get a light source underneath (books from the club library may be a possibility). Your subject will need to rest on this black card. A light source, either a flashgun with off camera cable, LED torch or light box. 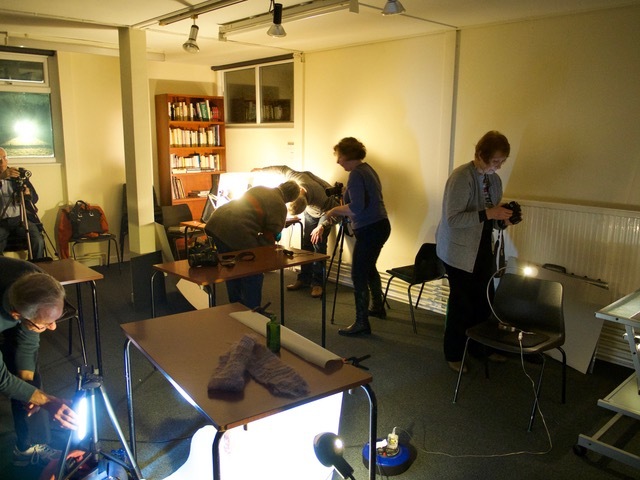 We have table lamps, studio flash and tungsten lights in the darkroom for the more ambitious. A method of holding up background card/paper. This might be the main challenge. Improvisation is part of the fun. Bluetac, pins and plastic spring type clips (£1 shop) may help. Some sort of background & lighting diffuser such as a white perspex sheet or an improvised version using tracing/greaseproof paper, bulldog clips and a simple wooden picture frame (pound shop or charity shop). The glass from the frame may also be useful for some set-ups. Whilst this subject may not inspire everyone, why not dust off your camera, come along and take some pictures anyway. Some examples from Stuart Martin and myself from an earlier session are attached as examples. We are open to any alternative ideas. WHAT: Photography is a great means of storytelling and it is often said that a picture is worth a thousand words. However, anyone can take a photograph, but telling a rich story through photography is another matter. By using a camera to tell a visual story, you not only capture a moment in time, you also suggest an underlying narrative that hints at something much bigger. Our Stories is an exhibition devoted to documentary photography, which is often used to chronicle significant events or environments, historical events and everyday life. WHO: Anyone who you think may enjoy a photographic exhibition! (Please note that dates may be subject to change. We advise you to check our website for the latest information prior to attendance. Only a selection of photographs from this exhibition will be shown in each gallery. As such, not every photograph will be guaranteed to feature in each location along the tour. Please contact us for more information. Disabled visitors are advised to check with us, before visiting an exhibition, that suitable access can be provided). Bill Salkeld put together a very interesting topic for our member’s evening in November. Given the challenge of taking 4 images and handing them in to be amalgamated into a group slide show of all the contributors – all by 9:00! The 4 image subjects were; a close-up shot, a portrait, plus two images outside the Guild – a street-light scene and a night-time ‘road’ image. Members could use their own or the club’s laptops or could use other processing means e.g. camera phone or ipad apps. A very busy evening’s photography and processing took place and we then all enjoyed reviewing and commenting on the images taken. So who is tonight’s speaker? Someone named Sean Conboy who is described on his website as “An internationally renowned photographer, who provides architects, construction companies, designers and the world of advertising and marketing with a standard of work that only leaves you questioning the standards of others.” Also his website mentions that he is an Ambassador for top range photographic equipment like Hasselblad, Linhof and Broncolor. His Hasselblad camera costs as much as a family car!! So, the question comes to mind … how relevant is this person to members of a local camera club in Wilmslow? Sean began his presentation by telling us about what had led him into a lifetime of photography and his international reputation. The gift of a movie camera from his grandfather was the beginning. 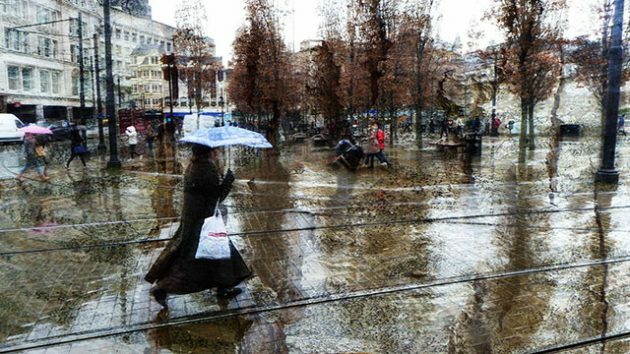 He used it to make short films whilst at school in Blackpool and the new found love of photography took him to study the subject at a highly reputable college in his home town. By now he had decided that he wanted to be a stills photographer. During his year out from college, on work experience, he was allowed to use a Hasselblad camera and all the film he could use! 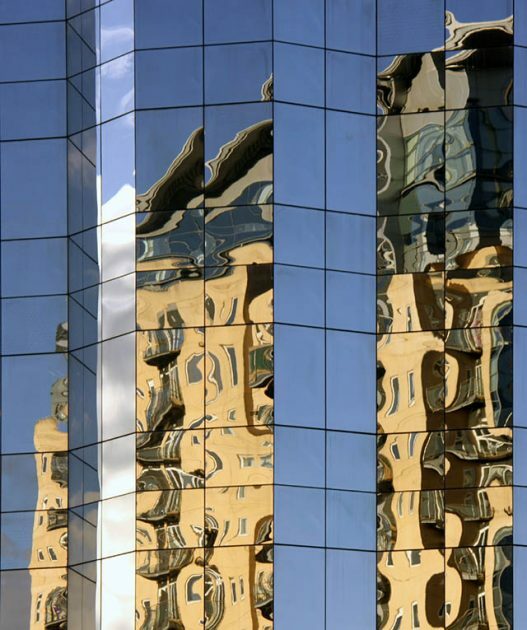 Having finished college he went to London where he gained invaluable commercial photography experience and also spent 18 months working on a cruise ship. Significantly, whilst in London he had the opportunity to attend a lecture where ‘the best architectural photographer of his day showed pictures and did demonstrations.” He then knew what he wanted to do. Blackpool Winter Gardens by Sean Conboy. Today, he is an Ambassador for Hasselblad and Linhof, the top technical photographic equipment available. Wonderful images from various places around the world including Dubai, Tokyo, Kuala Lumpur, Australia, Gibraltar, Blackpool and Manchester (!!) demonstrated the range and quality of his work. 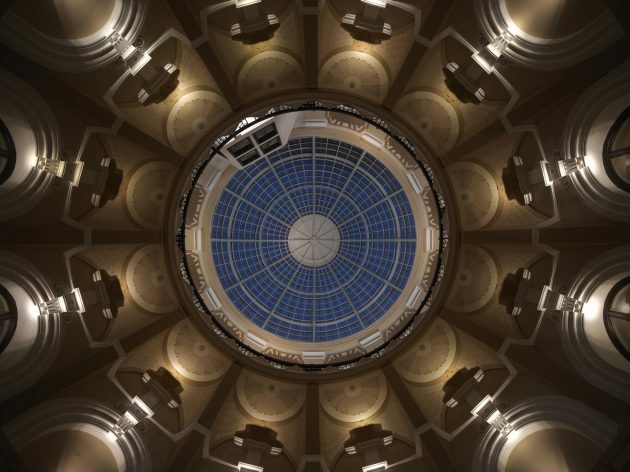 He talked through some of the technical challenges and solutions of architectural photography and the use of lighting to illuminate and / or creatively enhance his images. 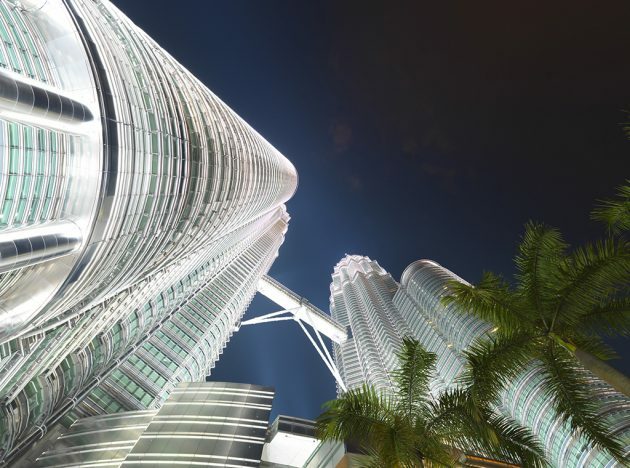 Petronas Towers Kuala Lumpur by Sean Conboy. By the end of his talk he had bridged the gap between the highly technically competent professional commercial photographer and the enthusiastic amateur by setting out certain principles and attitudes that can be applied to both disciplines and in doing so demonstrated his basic love of photography. On Wednesday last we enjoyed a most entertaining and informative evening with Nick and Caroline Robertson-Brown (www.frogfishphotography.com) who gave a presentation on Underwater Wildlife Photography. 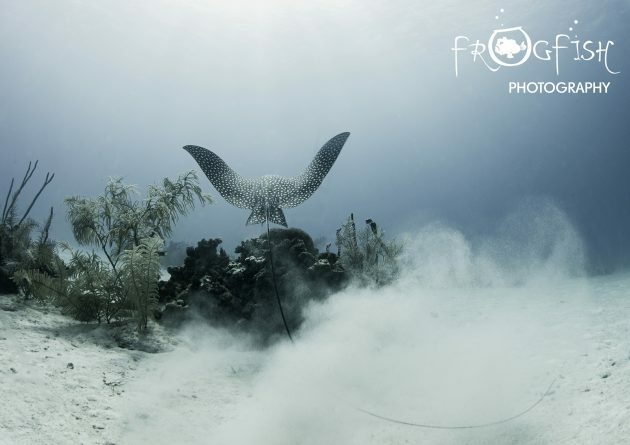 Using a series of wonderful images taken in various locations throughout the world, they talked through not only the technical challenges of their work but also about the artistic aspects of underwater photography. 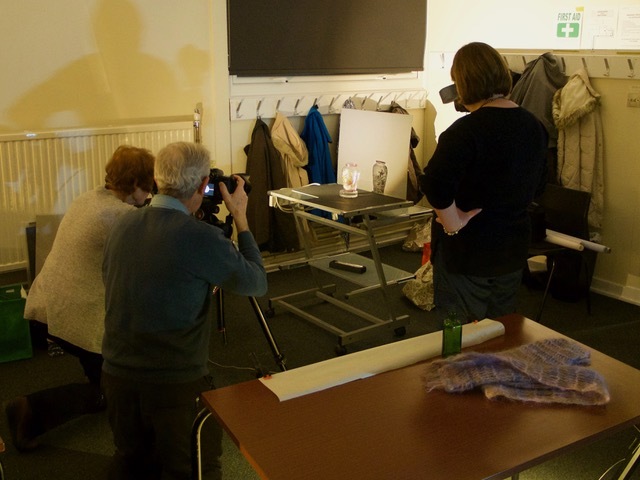 The ‘techies’ in the group had the opportunity to examine and discuss the photographic equipment that Nick and Caroline use. 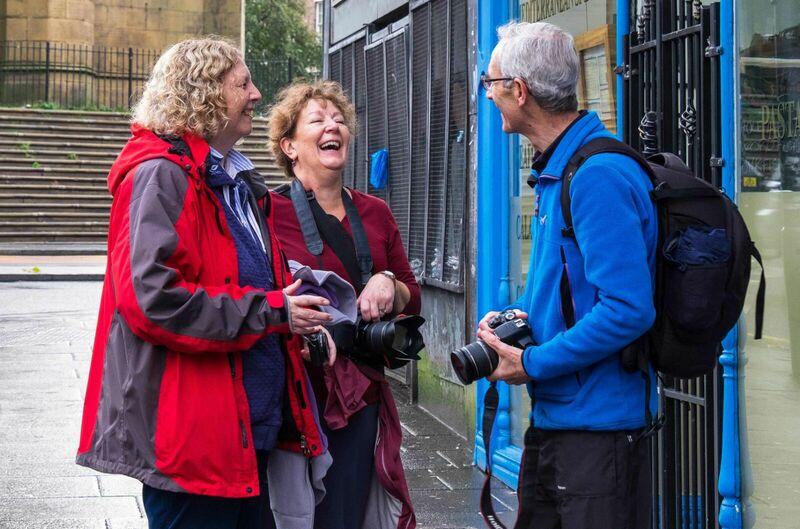 We also heard about their busy lives as award winning photographers and authors of books and regular contributors to diving, wildlife and international press. 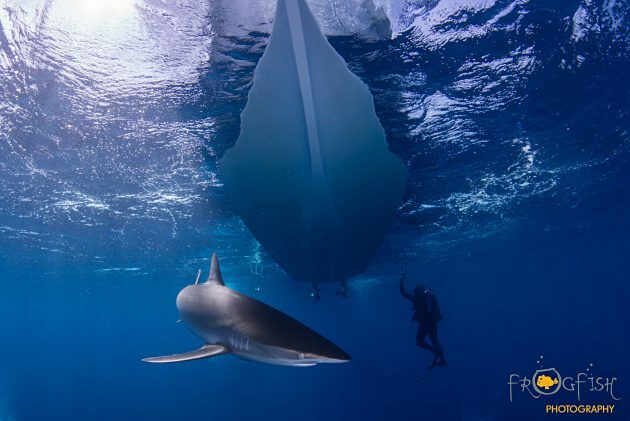 We heard about their passion about marine conservation and their role as UK Ambassadors for Sharks4Kids. It was a most fascinating and enjoyable presentation that gave us an insight into this specialist genre of photography. On a damp Tuesday morning in November seven intrepid souls ventured forth for the inaugural WGPS photowalk around Liverpool. We met at the Central Library – itself an very photogenic building; and over a coffee and cake went over the route for the day. 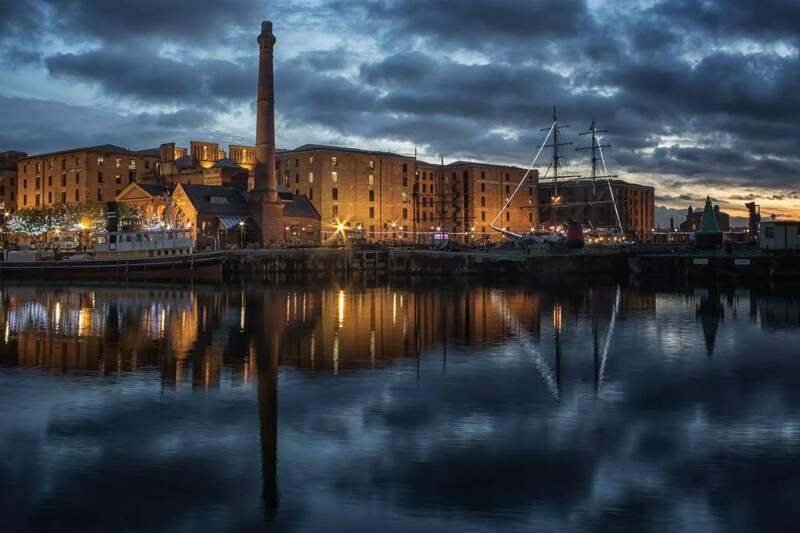 The day was a mixture of street photography around the city centre, picking out some great details in the period buildings and back streets and finishing with exploring the waterfront area from the Albert Dock along to the area in front of the Liver Building. We had a very enjoyable day and were blessed with some excellent light during the afternoon and some incredible sky over the waterfront area at dusk as the image above shows. A good number of excellent entries for both sections of our first monthly competition of the new season. And the first month using our new competition format where each month will have a colour or mono section in Part 1 and the second section will be on a theme or genre. The Genre this month was Tryptych and our members took up the challenge with enthusiasm. Congratulations to Adrian who came first in both sections, congratulations to the other winners and well done everyone for the high standard of entries. WGPS Photo Project Group – The next missions! Transport – as a warm up and review for possible entries into the Club monthly competition for February (25th January hand in date) . Shoes. Yes you read it correctly, Shoes! That should stretch your imagination. 3. Ghost signs – meaning the type of often faded and partial advertising or premises signs painted on walls and gable ends of usually brick buildings. Let’s see what can be found.